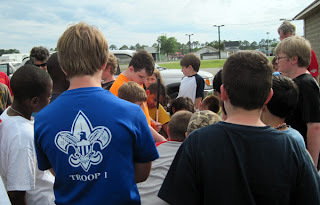 Taylor Jones Stebbins from Ravenel, SC, one of the “outa sight” young people with whom God has blessed my life, demonstrates his accessible technology to a gathering of Lowcountry Boy Scouts. 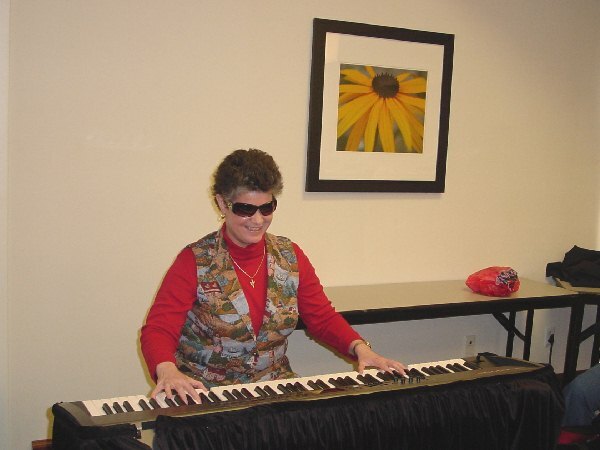 The ministry of Music By Laurel Jean continues to reach out with and on behalf of the blindness community. I especially thank God for opportunities like this presentation. 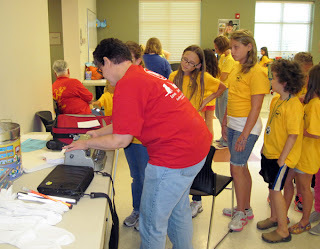 Thru networking with Dixie Land Guide Dog Users and the Association for the Blind and Visually Impaired of South Carolina, over one hundred scouts spent time getting to know Taylor, learning about white canes and guide dogs, and learning how to properly assist a blind person as a sighted guide. The Scouts’ participation in this event made it possible for them to earn their merit badges for disabilities awareness. Here I am on Francis Marion Square, with long-time friend Rev. Dave Andrus of Lutheran Blind Missions, Rev. Ed Grant of Calvary Lutheran Church, Charleston, SC, and Miss Shelby Craig, another “outa sight” youth. Dixie Land Guide Dog Users has launched “Keeping Families Focused,” an initiative in cooperation with my chaplaincy for blind youth and sponsored in part by the Association for the Blind of South Carolina. 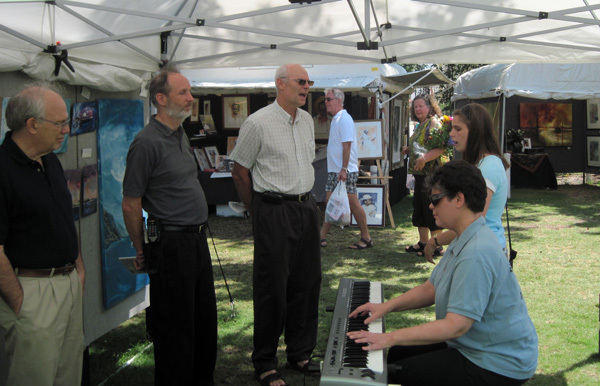 Several members of the blindness community gathered for a time of music, food, fellowship and accessible artwork. 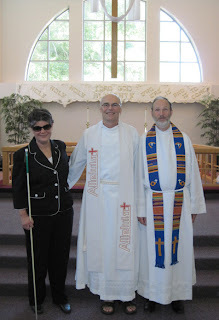 Pastor Dave was visiting Charleston in order to facilitate the beginning of a Christian Outreach Center for the blind, one of over 60 such centers in the United States. 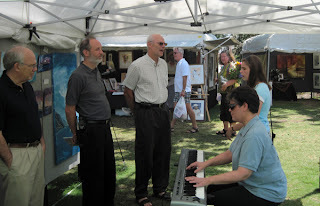 It was an honor to have among our guests Pastor Dave and Pastor Ed of Calvary Lutheran (the host site for the newly-established “Friends of Bartimaeus” Outreach Center). 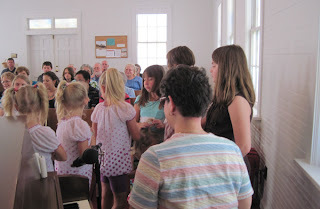 It was like “old home week” for me as we gathered around the piano for an impromptu sing-along. All in attendance were treated to lunch sponsored by Retina Consultants of Charleston. 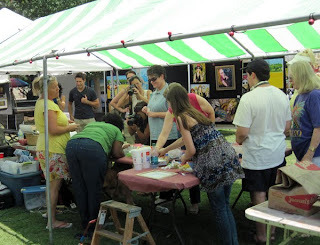 Everyone enjoyed Danita Cole’s demonstration of accessible artwork, each creating a unique work of art using multi-colored bees wax and a variety of cutout shapes. Here I am again with Pastor Ed and Pastor Dave, this time at Calvary Lutheran Church. It is so amazing how God works! 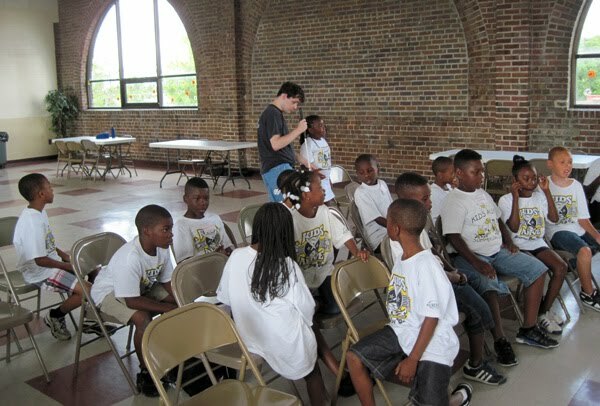 He knew in 1998 when I met Pastor Dave, and in 2005 when Pastor Dave and I met ministry associate Audrey Gunter, that the blindness community in Charleston would be blessed by an opportunity to share in worship and fellowship in the very unique, safe environment offered by the “Friends of Bartimaeus” Christian Outreach Center. Throughout the summer, I was honored to work in cooperation with Dixie Land GDU and the AFTBVI, participating in several presentations for summer day camps in the Charleston, SC area, hosted by the Charleston chapter of the ASPCA and the City of Charleston. 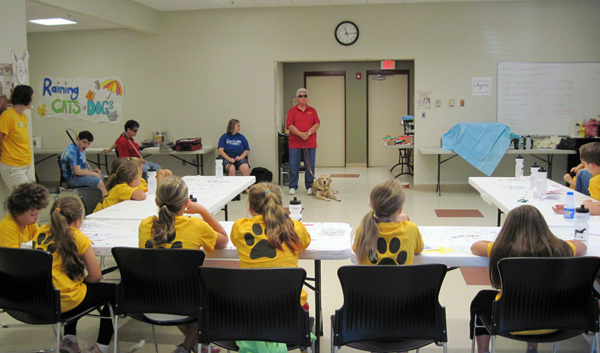 Here I am demonstrating Braille to young people attending a session of the ASPCA “Bark Camp.” The kids always enjoy learning about the Braille alphabet and seeing their names in Braille. Some even wanted to try their own hands at using the Braille writer. 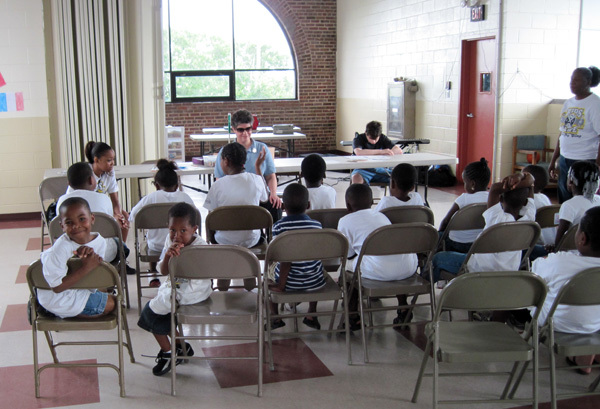 Reading with sighted kids always offers an opportunity for education. As the kids told me about the pictures in the book that I read to them, we all learned important lessons about healthy inter-dependence. 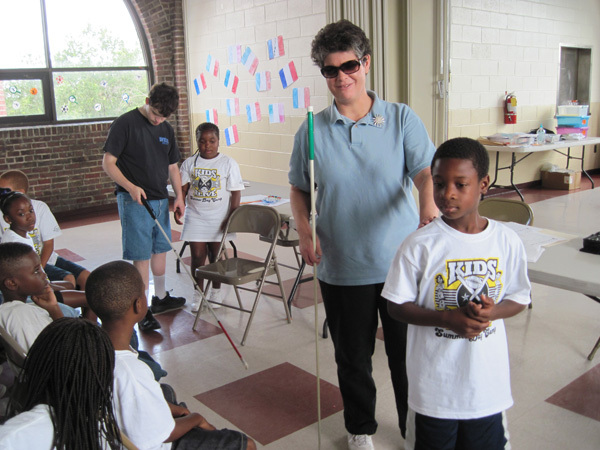 Here I am demonstrating the proper technique of serving as a sighted guide for a blind person. Taylor assisted me in demonstrating how we use our long, white canes to navigate independently. In July, I accompanied 19-year-old Brianna and her guide dog Lacy to my home state of Illinois, where we spent a few days doing a variety of music, ministry and mission works. Thanks to Rev. 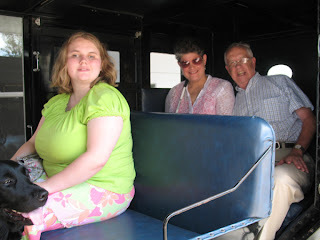 Ken Roedder and friends Jerry and Betty Jane Hale, we were invited into an Amish home and were even given a buggy ride! Ironically, as much as the blind people wanted to personally meet the Amish, the Amish people wanted to meet us! Brianna taught our hosts how the blind can be literate and travel independently. We enjoyed an afternoon of lively conversation and lots of Q-and-A. Many thanks to our Amish friends, Lorena, Katie, Mary and Alma for the delicious food and warm hospitality. Thanks also to Mary and Jim, Joyce, Pastor Phil and his wife Connie, Pastor Lynette and the Lakewood, Il United Methodist Church, James and Nancy, Linda, Millie, Sister Mary Alice and everyone at Sacred Heart Convent, and Miss Millie for playing such important roles in a truly blessed weekend. Back in South Carolina, the summer drew to a close with music and ministry at Rehobeth United Methodist Church in McBeth, SC. As always, I especially enjoyed my time with the kids. 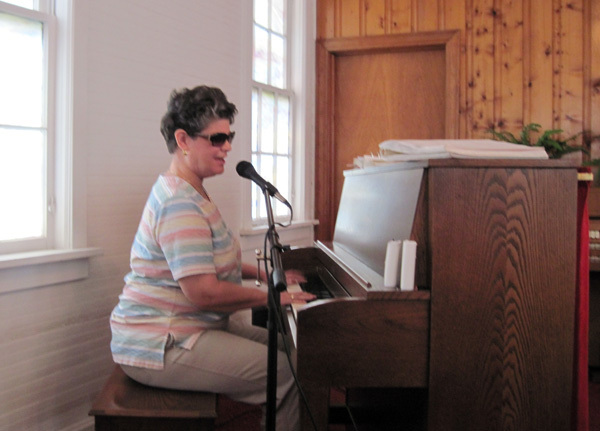 Thanks to Pastor Bonnie and everyone from the Rehobeth and St. Stephen churches, along with Brianna, Audrey and Susan who joined in the music, fellowship and ministry. 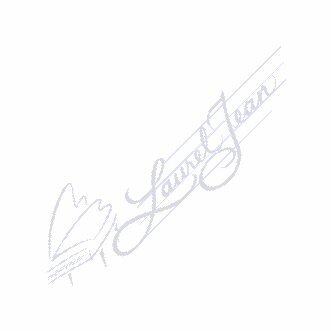 Thank God and thank you, for your ongoing prayers and support. Stay tuned for more posts like this one. Until next time, God bless you and keep His Song in your heart!